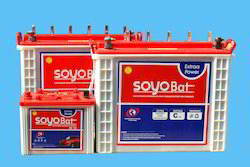 SOYOBAT™ Hi-per Induro Tubular battery is an all purpose continuous source of power. It is suitable for multi-activities, where power cut can cause heavy damages and great losses in terms of energy, working hours, machinery and money which can give rise to multiple losses in services of all kinds. SOYO EXRIDE™ Hi-per Induro Tubular takes care of all such functions arising due to sudden power break. This battery providing for next generation tubular batteries designed specially to withstand long frequent power cuts and requiring very low maintenance. Heat sealing method using FFT (Fused Fusion Welding) technology provides longer life. They are ideally suited to use in applications that require deep cycling. Fused Fusion Welding (FFT) technology provides longer life. Strong rugged container with heat sealed cover handless for easy lifting. Micro porous aqua trap ceramic vent plug with electrolyte. Supplied on factory charge tested condition. Introducing Soyo Exride™ Automotive Batteries which provides torque power to achieve instant cranking. Designed to make cars with higher efficiency. Automotive battery is a power house of a battery on Indian terrains. 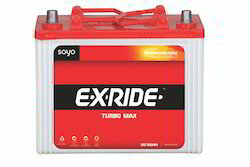 Soyo Exride™ Turbo Max 50/ 60AH is a special purpose car battery to provide power for your car which will never stop you. This ideal power source has empowered car owners with a sense of reliability. Its long life, power and safety is remarkable. Go ahead, drive your heart out, your car isn’t going to skip a beat! Stronger, more durable and long lasting life. Heat sealed low maintenance battery. High-energy density with maximum power. Instant and high charge acceptance. Vibration resistant resulting in longer life. 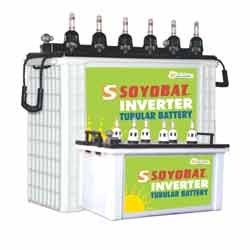 Introducing SOYO EXRIDE™ inverter & UPS batteries. These tubular batteries employ pioneering research & development to offer 360° benefits with cutting-edge process controls in line with global standards. These batteries charge faster and last longer. As the result, there is reduction in electricity consumption & increased savings. SOYO EXRIDE™ Inva Fuel battery is an ideal power source. It has empowered diverse corporate, industrial brands, factories and commercial segments with peace of mind. It also has a low-maintenance edge, because this trust worthy name is designed to sustain frequent power cuts. With the new technologies and engineering, we are proudly presenting our tubular batteries across India. Inva Fuel is now a symbol of trust with some of the most trusted world class brands. German spine tubular (GST) technology with pressure die-casting machines. Extremely high purity, corrosion-resistant proprietary spine alloy ensures longer life. Extremely superfine void-free grain structure ensures corrosion resistance and high operational life. Equally spread positive active material for better functioning and very low top-up. Extra-strong, flexible oxidation-resistance gauntlet for higher performance & long cycle life as well as quick charge acceptance. Looking for Lead Acid Tubular Battery ?